Appian Way is a street located in the suburb of Burwood in Sydney, New South Wales, Australia with a novel private park. Appian Way Conservation Area BURWOOD 1-25 & 2A-18 Appian Way; 302-318 Burwood Road; and 70-78 Liverpool Road. “The picturesque houses create an asymmetrical, multi-gabled roofscape with a variety of materials used such as slate and terracotta tiles and feature varied designs. “The houses are complemented with landscaped gardens, lawns and a nature strip with Brush Boxtrees. The serpentine street runs between Burwood Road and Liverpool Road with a communal reserve that has been converted into a lawn tennis club. Also known as the Hoskins Estate, Appian Way was a model housing estate conceived by a wealthy industrialist, George J. Hoskins on 8 hectares of land that he purchased at the start of the 20th century. More at Wikipedia. 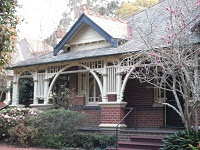 A builder of federation arts and crafts style houses in Sydney and the southern highlands of NSW from 1880 to about 1940. 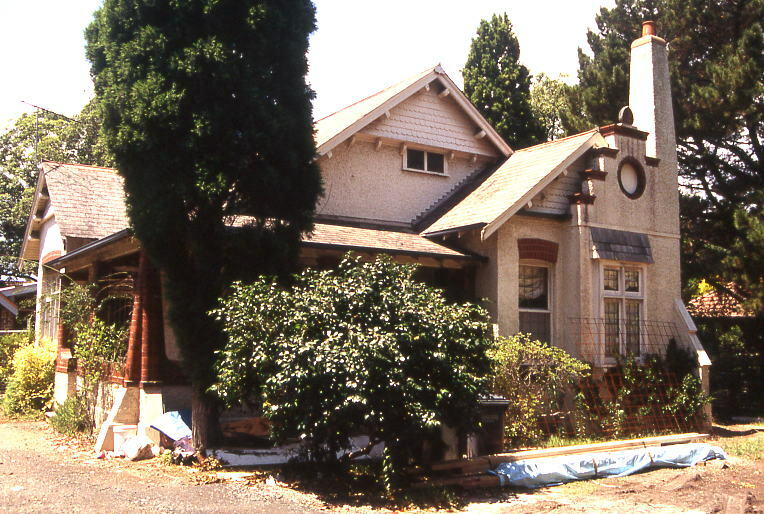 He designed and built the houses of the heritage listed Appian Way in Burwood as well as mansions for the Hordern family. 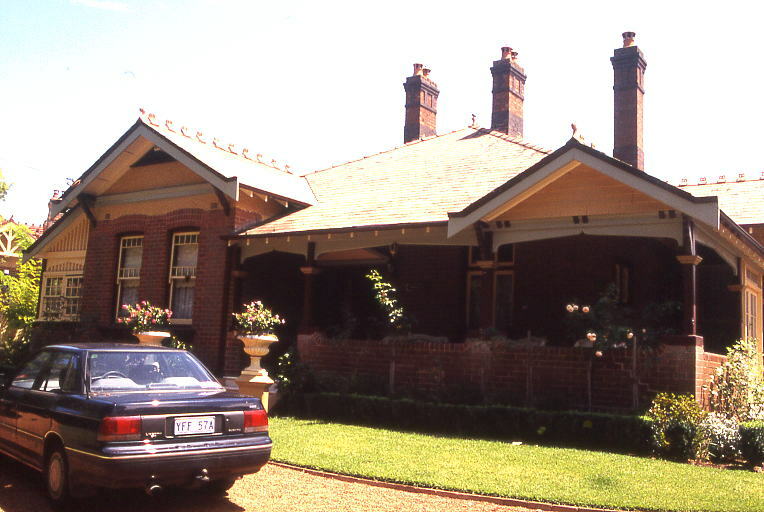 ‘Colonna’ 304 Burwood Road Later Queen Anne style, quite restrained and a very large residence. ‘Brianza’ 3 Appian Way – Typical Federation style, however chimneys are quite special, because they are not square with the frontage on the right. 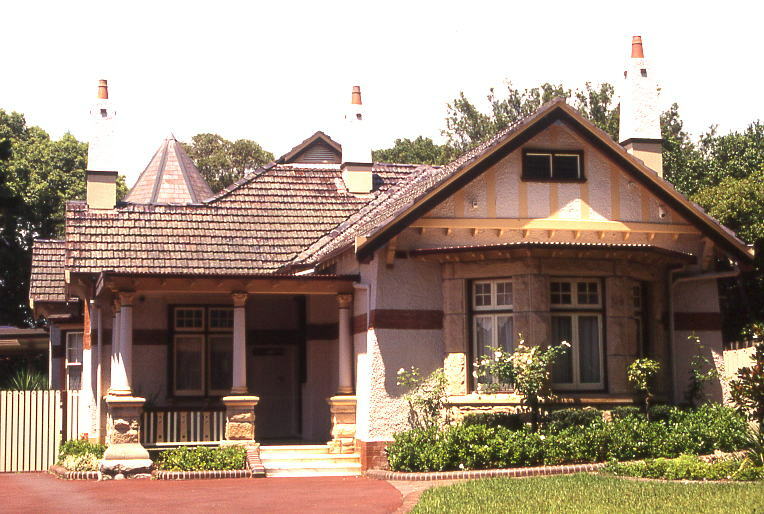 ‘Mevania’ 7 Appian WayAsymmetrically placed portico and asymmetric roof hipping, a bungalow with smaller verandah. Ostia, another Federation Bungalow, with extensive verandah and hipped roof-line. Set in the leafy grove of the Appian Way, the district’s finest Federation heritage precinct, Ravenna is a magnificent Federation residence which radiates a timeless sense of elegance & grandeur & all the splendour of a more gracious bygone era in a dress circle location. A wealth of original features – ornate hall arches, ceiling roses, leadlights, tessellated verandah tiles, fireplaces with surrounds, to name but a few have been meticulously restored to heritage approved standards. Peacefully & privately positioned on a 1,680 square metre site, with grounds, gardens, full-width deck & pool bathed in coveted northern sun, this exceptional property is crafted for the entertaining lifestyle. The regally proportioned interiors comprise formal lounge with bay window, four bedrooms, master with dressing room & ensuite, dining room, kitchen & family living area, main bathroom & laundry with extra toilet/shower, and air conditioning throughout. There is a tandem lock-up garage & security. “A storm is brewing over Burwood’s prestigious and heritage listed eight-hectare Appian Way, which has the potential to pit neighbour against neighbour as council and residents wrangle over how to solve dangerous flooding on the northern low-lying area of the historically significant precinct. Burwood. (He was not responsible for the five houses on the north side of Liverpool Road, which, although part of the original estate, are slightly different in character.) To win this contract he must have established himself as a reputable builder. 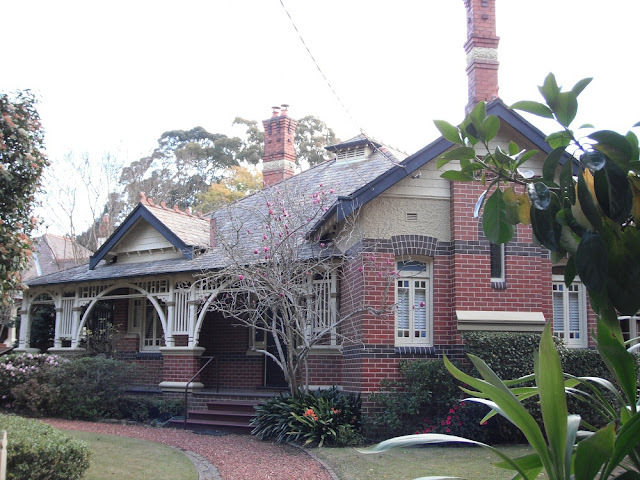 The houses are, without doubt, some of Sydney’s finest examples of Federation housing. Retford Park, East Bowral, built for Samuel Hordern 1887. Anthony Horderns new buildings in Sussex Street, Sydney, and additions to the New Palace Emporium. Architect Morrow & de Putron. Extensions to Retford Hall, Darling Point – ballroom. Architect Morrow & de Putron. House now demolished. “‘Benwynch’ is a blue ribbon residence occupying part of the Appian Way estate, and is unmatched in grace and elegance retaining 100% of its original features such as fireplaces, soaring ornate ceilings, rich coloured lead lights, intricate detailed joinery and 4 sets of casement bay windows. . 5 generous bedrooms . Gracious and elegant formal lounge plus separate interconnecting dining and grand entry vestibule . Return verandah, family room with lead light sky dome, country style updated eat in kitchen . Family and sun room areas open to private pool, upstairs rumpus/billiards room enjoying district views . Abundance of storage, paved driveway (off Claremont Road) to double garage (potential cabana), paved terraces and approx 1550 sqm of landscaped gardens”.